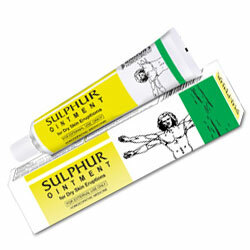 Buy Bakson's Sulphur Ointment - All purpose antiseptic cream for dry, scaly skin, itching, pimply eruptions; rugged skin at folds. All purpose antiseptic cream for dry, scaly skin, itching, pimply eruptions; rugged skin at folds. Apply externally twice daily to properly cleaned and dried affected portion.